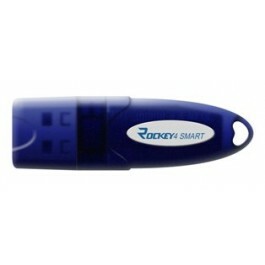 ROCKEY4 SMART software protection dongle hardware is based on smart card chip. Its design of hardware provides complete protection mechanism and high level of integration, which is remarkable comparing to usual MCU chip. The smart card chip has the capability of resisting electron detection attack (SPA and DPA) and physical attack (SiShell). The smart card chip and its manufacturer have passed EAL 4+ and IT SEC certification. Its usability and stability are also regulated by ISO/IEC 10373 standard. - Hardware based soft clock. - Smart card based software protection dongle. - Communication datagram encrypted against interception. - User definable 8 bytes dongle password. -USB driverless deviceUniversal unique hardware ID. - Provide shell encryption tool. - 2 levels-4 groups (basic password & advanced password) password management mechanism, i.e. developer password and end-user password. - 1,000 bytes user space. - Provide 64 module control units. - Support for 128 user defined algorithms. - Built-in seed code algorithm. - Standard USB 1.1 device, support USB 2.0 interfaceCompliant with CE and FCC standards.Support multiple operating systems:Windows 2000/XP/2003/Vista/7,Linux and Mac OS. 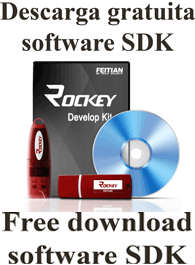 - Provide multiple software programming interfaces: Delphi, Power Builder, Python,Fortran, Java, RealBasic, Oracle, SQL2000, FoxPro, VB, VBA, VC, C# and VB.NET etc.